The Canon EF 28mm f/1.8 USM Lens is currently Canon's fastest 28mm lens. 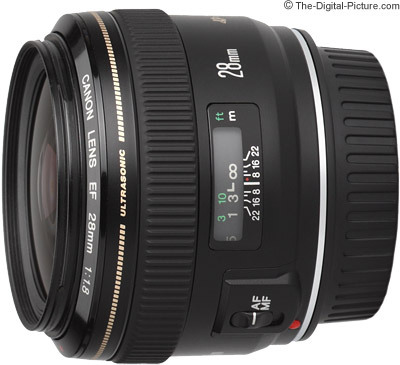 And the only wider angle lens that is faster (wider aperture) is the Canon EF 24mm f/1.4L II USM Lens. My first thought upon removing the 28 f/1.8 from the box was that it was very similar to the Canon EF 20mm f/2.8 USM Lens in size, build quality and appearance. And that is a good thing. Not the best of the best, but nice. The Canon EF 28mm f/1.8 USM Lens utilizes USM (Ultrasonic Motor) for quick and quiet autofocusing - much quieter than the same-focal-length Canon EF 28mm f/2.8 Lens. This is also a good thing. Focusing speed is similar to or a little faster than the f/2.8 version. FTM (Full Time Manual) Focusing is a nice feature in this lens. This is a small and light lens that handles very well on any sized DSLR. It is dwarfed by the Canon 24-70 L Lens below. 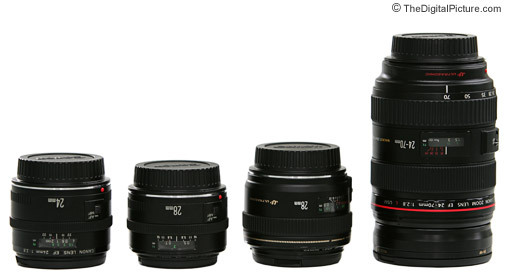 Pictured above from left to right are the Canon EF 24mm f/2.8 Lens, Canon EF 28mm f/2.8 Lens, Canon EF 28mm f/1.8 USM Lens and the Canon 24-70mm f/2.8L USM Lens. The 28 f/1.8 benefits over the 24 f/2.8 and the 28 f/2.8 from a more-modern styling, reflecting its later introduction year. A more-useable manual focus ring is one of the benefits of this design difference - this lens manually focuses very nicely. The Canon EF 28mm f/1.8 USM Lens is soft wide open. Stop the aperture down to f/2.8 and the center becomes sharp. Mid-frame performance (on a full frame DSLR) is softer - even stopped down. Corner performance does not degrade much (if any) over the mid-frame results. I'm disappointed by the sharpness delivered from this lens - It's not up to my expectations. Another disappointment is the very obvious CA (Chromatic Aberration) the 28 f/1.8 exhibits at mid and corner portions of the frame. Proneness to flare is another notable negative characteristic. Though it is not bad, some barrel distortion is present. Background blur quality is decent. Out-of-focus highlights have 7 sides when the lens is stopped down thanks to a 7-blade aperture. I compare the Canon EF 28mm f/1.8 USM Lens with a few other lenses in the Canon EF 24mm f/1.4L II USM Lens Review. Visit that page for some 100% crop samples showing this lens' performance. 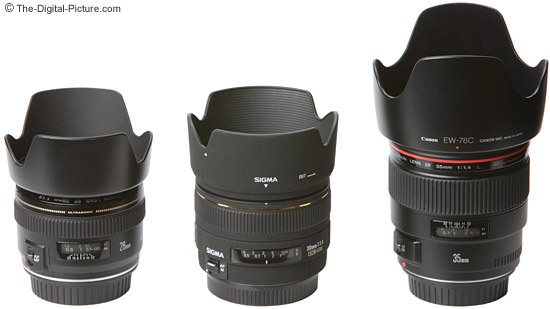 Pictured above from left to right with lens hoods in place are the Canon EF 28mm f/1.8 USM Lens, Sigma 30mm f/1.4 EX DC HSM Lens and Canon EF 35mm f/1.4L USM Lens. The 28 f/1.8's Minimum Focus Distance and Maximum Magnification are nothing special, but on par with its peers. If (unfortunately, that is a big if) the Canon EF 28mm f/1.8 USM Lens' image quality is good enough for you at f/1.8, this lens will make a good low-light handholdable lens. On a 1.6x FOVCF body, the Canon EF 28mm f/1.8 USM Lens makes a near-normal 45mm lens. For those who have grown used to a 50mm lens on their film SLRs, you will feel at-home with a 28mm prime.